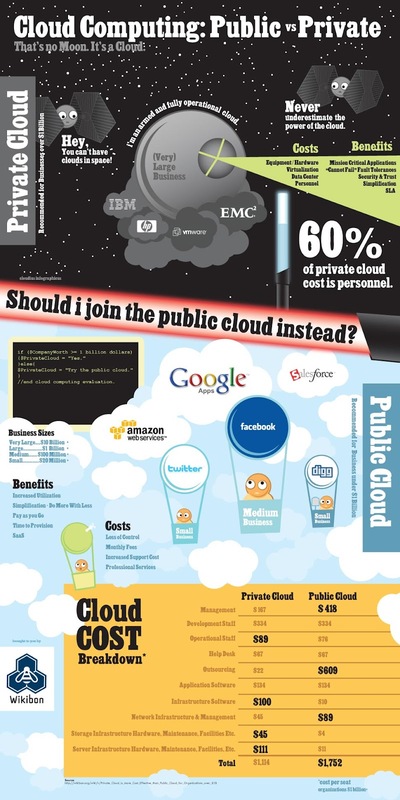 Should I join Public Cloud or Private Cloud ? There are two troops of Cloud Army : IBM , VMware, HP & EMC2 form one troop while Amazon, Google & Salesforce form the other troop. Yes, you guessed it right first troop provides Private cloud services and latter provides Public cloud services. Lets take a close look on which is the best as far as money is concerned.Cloud cost breakdown table at the bottom clearly explains the cost involved for every service provided by either private or public cloud provider. If your company needs elasticity (frequent scale up and scale down in IT Infrastructure) you should go with Public cloud to maximize the ROI else Private cloud is the way for you. Note : Security concerns are not considered yet.